1990: 93-85-88 = 266 points (20th). 1992: 87-80-96 = 273 points. Overall Build: Powerful heavy; thin fur; good colour; markings still obvious; correct forehead, weak underjaw; eyes medium brown; short neck; short back; very good croup; sufficient front and rear angulation; sufficiently strong bone; free gaiting, back and ligaments sufficiently firm. Nature: Calm, open and sure. Very high protective instinct and fighting spirit, high courage and hardness with middle sharpness. Note: No limitation in drive area, pay attention for very good conformation in breeding partner. Dunja vom Worringer Bruch was a participant in the D.V. Meisterschaft in 1990 and passed the Körung 'for life' with highest possible ratings for hardness and working drives (very high protection, fighting spirit, courage and hardness with middle sharpness). Dunja's litter-sister, Diva vom Worringer Bruch, passed the Körung with highest possible ratings for hardness and working drives. 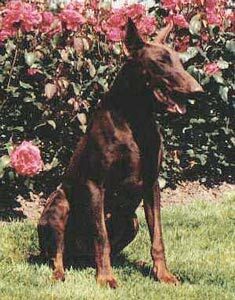 She was also the brood female for the Worringer Bruch Kennel in Nordrhein, Germany and dam of the vom Worringer Bruch “H, J, K, L, M” litters (Hanko, Hera, Joy). Dunja's litter-brother, Dino vom Worringer Bruch, qualified and competed in the D.V. Meisterschaft. Dunja's brother from a repeat breeding, Gringo vom Worringer Bruch, passed the ZTP with 1A rating for character and SG for conformation and earned the highest protection score (98 points) at the D.V. Meisterschaft in 1994. Gerry: IPO 3, DV-DM participant, IDC-WM participant (placed 8th in 2000). Granit: SchH 3, FH, DV-DM participant (placed 5th in 1998), IDC-WM participant and passed the ZTP with 1A rating for character and SG for conformation.